This is definitely the age of the Russian Imperial Stout. Check any beer review website or ask your local craft beer store clerk which beers are hot. Stouts are the rage. Maybe it's because beer people were tired of being upstaged and outclassed by wine snobs, and they wanted to showcase beers that can be consumed like wine, sip by sip over the course of an evening. 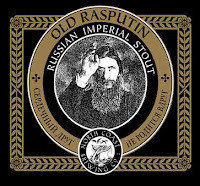 Stouts are the ticket to that ride, and Old Rasputin does the job as well as any. I liked quite a few of these imperials this year, including Bell's Expedition Stout, Surly Darkness and many of the specialty stouts put out by Southern Tier and other breweries. I chose Ol Raspy because it was one of the first I had, and the aforementioned breweries each have a beer (or more) I had rated higher. By default almost, but taking nothing away from this outstanding brew, North Coast finds its way into the top ten. As I alluded to earlier before veering off, these dense, hearty beers are meant to be enjoyed gradually. If a Miller Lite drinker attacked this beer with the same vigor as they would a homecoming kegger, the results would be disappointing. Each sip has many stages and should be enjoyed on the nose, lips, tongue, roof of the mouth and throat. I especially enjoy the buttery coating left in the crevices of your mouth. This beer is--buzzword alert!--smooth, it's rich, and above all, it's tasty. It can stand alone and doesn't need to be used to rinse your mouth after a big swallow of food. The taste evolves as the beer warms. The sharp sting down the throat is most evident when cold, but the sweet gooeyness is best enjoyed warm. If you want to sit down, engage in conversation with friends, and delight in a warm, comforting drink as you go, pick up a bottle of this. It's not too scary for the average beer drinker, but it's still rewarding for the most particular connoisseur.